The key functional aspect of trouser cloth is the body that enables it to drape well and hold its shape. It should throw a nice, clean line down the leg, hold its crease, and recover from wrinkling when hung at the end of the day. Unfortunately, this is much easier with heavy materials. In summer there is therefore a consistent trade off between coolness and performance. In this latest instalment in our Guide to Cloth series, we will run through the different options – the fibres, yarns, weaves and finishes – to make you aware of exactly what these trade-offs are. It is then up to you which trouser cloth you pick – one which, as we will see, is largely a question of style. Linen is often seen as the king of summer cloths. It certainly has functional appeal: it is cool to the touch and breathes well. The biggest downside is style: some dislike how much it wrinkles, and for many others this feature just makes it too informal for the office or other formal environments. The effect can be mitigated by heavier weights (as is the case with all these trade offs). Irish linens, coming in around 11 or 12 ounces, hold their shape much better than 8 or 9 ounce Italian versions, and are still very cool. I tend to wear and prefer them. Cotton generally performs slightly better than linen in terms of wrinkling, and can be woven quite tightly, which helps more. Cotton gabardine, for example, is a tightly woven twill – a twill having more cloth in it per inch, and therefore having more body, and gabardine being a particularly tight twill weave. Cotton can also come in two-way mixes (a little wool or cashmere) and a variety of finishes. Linen, by contrast, tends to be a simple plain weave and have a simple finish. Herringbone linens have a tiny bit more body. The problem with cotton is that it lacks the elegance of both linen and wool. I tend to wear cotton more as a casual trouser. It definitely has a coolness than can be attractive, but the style is a very casual, almost workwear one. For some this might be an attraction; for others, the opposite of what they’re looking for. Which brings us to arguably the best of all fibres, wool. Wool has the obvious advantage of recovering well after wear. Hang up a pair after a day, and it will have lost most of its creasing by morning. In general, animal fibres (wool, silk etc) will always crease less easily than plant fibres (cotton, linen etc). Wool also responds well to moisture, and therefore can have its creases fairly easily steamed out of it, unlike cotton and linen. That performance can be enhanced by twisting the yarn, to make a high-twist wool. This increases both its elasticity and its crease resistance. The only disadvantage to high-twist wools is that they tend to feel crispy, rather than smooth like a normal worsted – or, noticeably in summer, like linen. Interestingly, the best known of summer wools is fresco, yet it is not necessarily high twist. Rather, fresco has been defined by using relatively coarse wool, traditionally a particular weave, and a lack of finish that gives it a raw feeling. That raw, dry feel was historically associated with a cloth feeling cool and fresh – which in a way I can see. Softer things will often feel warmer against the skin. But today it’s hard to make an argument for fresco, given its roughness and the need for many customers to line trousers made from it as a result – negating the supposedly cool feeling. Some wools will also be open in their weave than others, but this doesn’t make much difference. A last word should be said about fibre mixes – usually a mix of three out of wool, linen, cotton and silk. Cotton/linen can be nice in more casual trousers, such as chinos and shorts. But it’s rarely a good idea in formal trousers – better to mix one or both with wool, in order to get its recovery and crease-resistance. Silk can have a similar beneficial effect, but usually it’s added for a particular look and feel, so carefully consider the style of anything with a high silk content. Style, then, is a big driver of what cloth to go for in a summer trouser. Linen is wonderful – truly one of God’s gifts – and I understand why some people are as fanatical about it as they are about flannel in the winter. But its style will simply make it a non-option for lots of people. 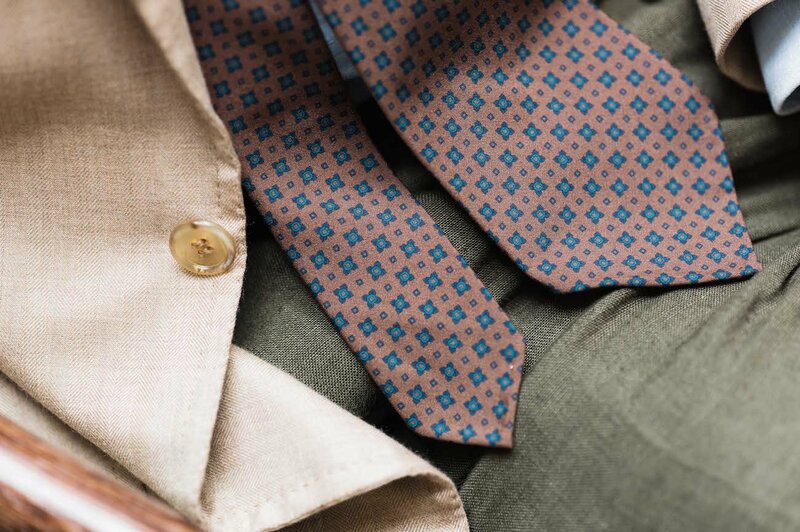 Cotton has its appeal, but it is a style one and a narrower one than linen. Lightweight wool is likely to be the safest option, particularly with smarter outfits for the office, or with a sharply tailored jacket. But consider whether you really like the crispiness of high-twist wool before you go with it. As with all these guides, I won’t recommend specific cloths or bunches. This is both because I haven’t tried them all, and because the differences between the various mills are much smaller than the variation described above – primarily in fibre, but also in yarn, weave and finish. You can follow the discussion on The guide to summer trouser cloths by entering your email address in the box below. You will then receive an email every time a new comment is added. These will also contain a link to a page where you can stop the alerts, and remove all of your related data from the site. Yay! 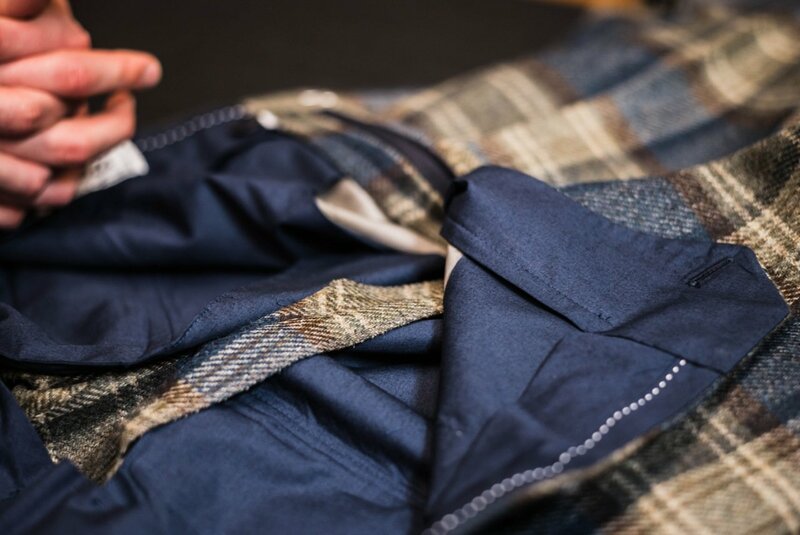 Another instalment of the Guide to Cloth. Quick question if you don’t mind, Simon: Coupled with the usual weather precautions like umbrellas, which trouser fibre would you say has the best chance of keeping the shins dry in the case of brief exposure to light or moderate rain? Wool is generally best. It dries quicker, and remains warmer when wet. Cotton is useless for that – hence the old Army phrase ‘cotton kills’ in regards to uniforms. Do you ever get summer wool trousers unlined? Interesting point regarding fresco’s appropriateness for summer. I opted for a navy fresco fabric for the purposes of a suit for my upcoming wedding (September), and have been surprised at each fitting by the stiffness of the material, which feels like a strong mitigating factor against the coolness the open weave affords. Having said that, I’ve only worn it indoors so have yet to get a sense of how it breathes out in the open. Mr Roetzel, the authorof the book The Gentlemen, recommended as well Barathea cloth. I haven´t found much information about that. Would you recommend it as well and if yes, why? In general Phil, I wouldn’t recommend it for a summer trouser – only for more formal outfits such as evening wear. I’m very surprised by your comments on fresco, as they are rather inaccurate. All frescoes are high twist, and finished with an open weave; the method of weaving was patented, being designed in particular for warm weather. It is this rather than the hardness of the cloth which makes it wear cooler, and nothing at all to do with hard vs soft against the skin. Sorry to have to correct you Simon, and I appreciate you are learning as you go along, but Fresco was patented in 1907 by Martin & Sons as a high twist, breathable yarn. Not as a name, but as a method of construction. That is now, and has been, the basis of fresco construction. As I said, this is not me learning. This is the result of several interviews with mill managers – all my writing is and has always been based on similar research. The fact it was patented as that does not mean it is necessarily how it has been defined in the industry over the past hundred years. It would be helpful to clarify your definition as well – a yarn can be high twist but not breathable. The weave can be breathable and the weave can have a particular construction. Perhaps you should read the patent; you would then accept I am right and you are not. It is my profession, not my hobby. There is too much “false news” around these days. Thank you. Let’s leave the discussion here though, that’s enough about the technicalities of fresco for anyone. Simon I think the roughness of fresco is less of an issue these days; Finmeresco has a smoothish finish, and Minnis lll is very soft to the hand compared with ll. The loose weave does make them very breathable cloths for warmer climates. I agree with the comment on Gilt Edge, which is a favourite of mine for the summer, and which despite its weight holds well as a trouser. And, not for the first time, let me suggest bamboo; smooth, light, cool, crease resistant and, rather nicely, quite a talking point. Thanks Nick. Yes, there is a question of whether you define historically as I mention, or current offerings. I guess current makes more sense. Simon, the blue loafers with tassels in the cover picture. Do you now where the shoes are from? I have a pair of wool-linen mix trousers that are easily the most comfortable and cool summer trousers I own. Interesting post… does the cut make any difference? I favour slim (not skinny!) trousers but find in warmer weather a lightweight fabric with a slim cut doesn’t feel as cool as a wider cut. Yes it does a little. Wider trouser legs may well have more air circulation. Thanks for this timely post! Tropical wool trousers look lovely. But allegedly, they’re not as cool as fresco. Is it really the case even when they’re light weight? I love linen jackets, but over the years I’ve noticed that I only wear them with cotton trousers. And yet I’ve no explicit rationale for such a choice. They generally won’t be quite as cool, no. Linen jackets often end up being worn with cotton trousers, because they can’t obviously be worn with linen trousers, and a linen jacket might be considered more casual and therefore suited to more casual trousers. But I would encourage them worn with a high-twist wool. I’m late here in my question but could you explain this comment about not wearing linen trousers and jackets together? I am not not much of an expert on clothing. Silk-linen is a blend that, in my experience, combines the lightness and breath-ability of linen with the wrinkle resistance of silk. I have bone-coloured trews in this cloth that I would wear everyday if I could get away with it: they go with everything, they’re light as air, and theyhold a decent crease. I second the point that cut is important. In Summer, a slightly looser cut all round, and with a higher hem. You describe linen as typically a twill … unless my eyes deceive me, that’s not the case. Where would you rank mohair? Would you consider it similar to a high twist wool or is it considered too warm for summer clothing? Thanks. It is probably most similar to the wools, yes, being an animal fibre. 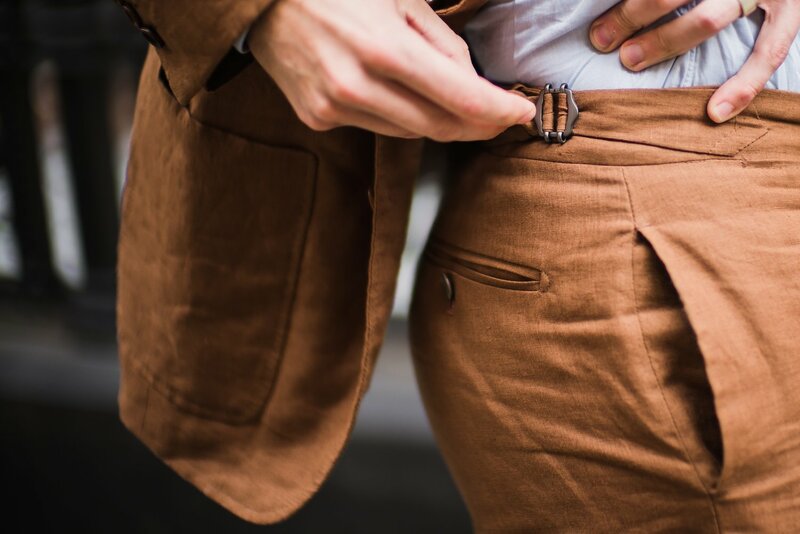 This post gave me the idea to commission a pair of tan Crispaire trousers. To wear with odd summer jackets, mainly navy or just with a shirt or polo. Simon, what’s your opinion on this? Hello, Simon. The raw silk is not the breathing material like others. I would like to call them summer tweed. However, I’ve noticed some gentlemen wearing the silk suits in the old movie. How do you think the silk suits nowadays? Silk does have some cooling properties, but generally a 100% silk suit suffers from a certain look more than anything else – either a bit shiny, or with an odd slubbiness. Also not great in trousers unless pretty heavy. Regarding your March post on cavalry twill trousers do you think a good quality pair in navy would go well with a mid grey 13/14 oz woolen herringbone jacket( Australian winter). I have crispaire trousers and they are very balanced and wearable 3 or even 4 seasons with appropriate choice of knee socks. I have also tried 100% silk trousers. It was an interesting experience, but they loose shape too much and I would not repeat this experiment. Do you have the crispaire unlined? Also, do they hold a crease well? They are partially lined (for example on the knees). Yes, they hold crease pretty well. How about summer flannel?.Appreciate if you could share some insight on light flannel of 8 to 10 oz..
Not a big fan I’m afraid. You lose pretty much everything of what makes flannel nice (this will be worsted flannel). Better going for one of the other summer wools mentioned here. @ NIK ISMAIL ALMURTADZA: don’t go for lightweight Flannel. It loses its shape so fast and that’s horrible. I’ve tried 10/11oz Marling & Evans light grey with few success. @Anonymous under Hristo: go! Crispaire unlined for summer. It holds shape well. Mohair cloth from William Halstead is a magnificent summer cloth. Cool, lovely texture, comfortable, perfect balance of elegance and fun. 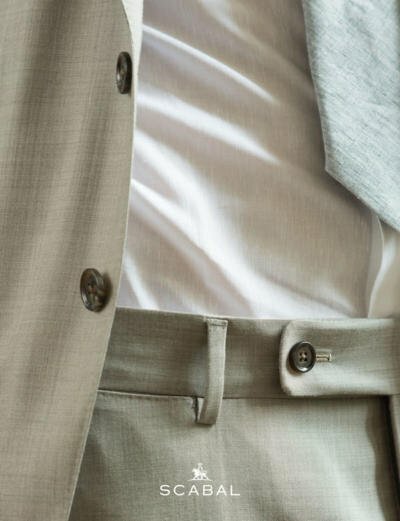 Something I’ve been wondering about linen – both trousers and jackets: What to do in between wears. Sending them to the cleaners seems like overkill, but starting the day wrinkled seems like a bit too much of an embrace of wrinkles. Trousers can be ironed, but what about a coat? With respect to linen, you mentioned above that Will Boelhke once said that linen looks best the first time it’s worn and the 10th”. I take it that this quote means that you simply get used to the wrinkles (i.e., embrace them) by the time you’ve worn them 10 times.? No, more that the wrinkles have become so abundant by the 10th wear that they become attractive. I really like the first picture but wonder about the versality of a navy loafer. They look gorgeous but isnt a brown color more safe? I own 3 loafers (different shades of brown) but are thinking about buying a navy pair. But are they too dandyish? I think the London Lounge Brisa and Piuma summer cloths also deserves mention. Brisa is a 13oz open weave like fresco, but butter soft and is really crease resistant. A wonderful cloth both for travel and wears very cool if unlined. Brisas have been made in solid colours like navy (I know you have said before that you are not a fan of some of the LL designs). I really hope you try Brisa (or other LL cloth as Piuma or Mistral) soon, as that is cloth far superior to what is discussed in this post and may change your perspective somewhat. Would that kind of collaboration not be worthwhile? To get LL quality out to the “masses” would be another great feat for this blog. Simon – I think this has been asked before, but I’m interested in an up to date answer – where in London can you buy cloth yourself that you can then take to your tailor? I’ve made a couple of mistakes when choosing cloth from small swatches before. Thanks! There are very few. My top two recommendations would be visiting Scabal and Holland & Sherry on Savile Row and asking what cloths they have in bigger lengths to see – or what can be ordered in. Even if you’re not buying straight from them, this gives you the ability to see the cloth at scale before ordering with the tailor. Hi Simon, following on the points raise above and yes, you’ve consistently said navy trousers are hard to match but can you suggest what colour and patterns that matches well with navy trousers….. Pretty much any colour and pattern will go with navy trousers – just as long as the colour and/or pattern means there is sufficient contrast to the trouser. The problem with navy trousers is that they often look like a piece taken from a suit, even in more casual cloths. It is for this reason that I recommend against them. Does this also apply to chinos worn without a crease? Aren´t they closer to blue jeans? No, it doesn’t. Blue chinos are fine. Thank you for posting this informative blog on the trouser trends this summer. It seems cotton is the best fabric to wear in summer. This blog will serve as pointers to a lot of people who are confused about what to wear in summer. Looking forward to reading more helpful posts in the future. Seersucker? Or is it too American? Works well in the high heat and humidity of the Deep South. Wrinkles? So what? It’s seersucker. Very quickly, if you only had 3 summer trousers and 3 summer jackets, what material and what colors would you have them? Of course. I was thinking something from casual to business casual. Given a choice between linen, hopsack and something like fresco or crispaire, for both pants and jacket, which would you go with? A little more information doesn’t help that much I’m afraid – if I’m to give a truly useful answer, that isn’t misleading, it would have to be lengthy and not really suited to a comment thread. What about linen? You said in your “how to dress in summer” post that you like it better than fresco or other high twist wools. Is that still true and did it apply to trousers, jackets or both? Another considered, helpful and timely article – and after a wardrobe review over the long-weekend, a challenge I need to address! Simon, quick question, do you have any thoughts on pleats for linen trousers? I tend to have double pleats and love them on my wool trousers, but it always seemed a bit weird on a more casual cloth like linen. But then I saw one of those pictures from your style guide, and now I am somewhat uncertain…seems like it can work…but also on the heavier linens I tend to prefer?…etc. Any thoughts welcome as always. Hey Simon, I have found darker oatmeal in combined shades of brown and grey in wool/linen blends to wear incredibly cool. Although they crease, it is my go to trouser to wear with linen and polo shirts for smart casual Fridays. On that note, I’m wondering if you have any suggestions for colors and cloths for summer trousers which can be worn in similar occasions? I have found cream/white linen to be quite showy. I have grey crispaire and fresco but find them too smart as well. I know that you like fairly slim fitting trousers but have you ever considered a summer trouser styled in the manner of Cary Grant in the movie To Catch A Thief?Personally,I think the style works only with a thin sweater or long sleeve polo shirt but not with a jacket .In the latter case the wider trouser leg just makes the outfit look too loose and somewhat old fashioned. It’s a good point. I do have some wider-legged trousers (sometimes higher waisted) and I do find them easier to wear with just knitwear, rather than a jacket. Simon et al, what fabric weight of wool trouser would you recommend for a summer trouser vs a year-round wool ? 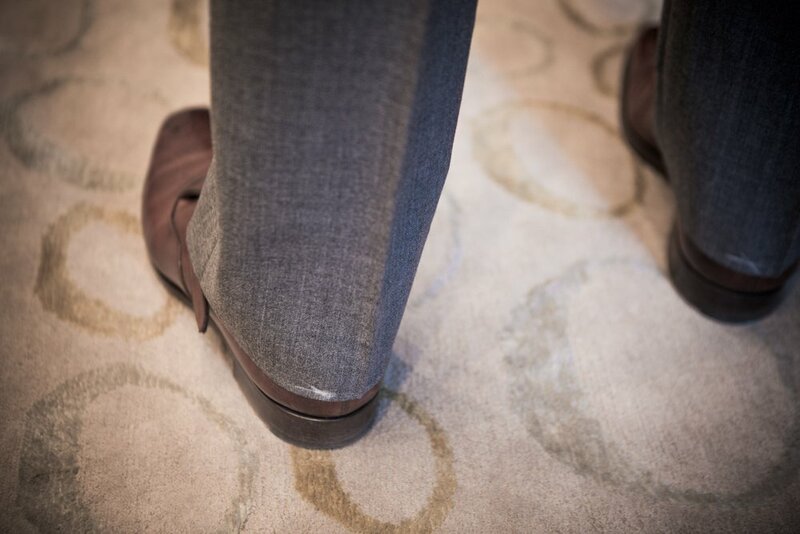 Perhaps a lightweight fabric may start to look to flimsy – like a worsted wool suit trouser? hey simon how useful would a pair of mid grey linen trousers be? Thinking of commissioning one but not sure if it’s useful – grey being better in wool and linen being better in less formal colours? I have a pair of dark grey linen trousers from Stòffa. They work equally well with a polo and sneakers as they do with loafers and unlined chukkas and a lightweight jacket in the office. Granted, not as formal as a high twist wool, but if you like linen and can wear it, it’s a great choice. Simon, what weight do you recommend for tailored cotton trousers in the summer? 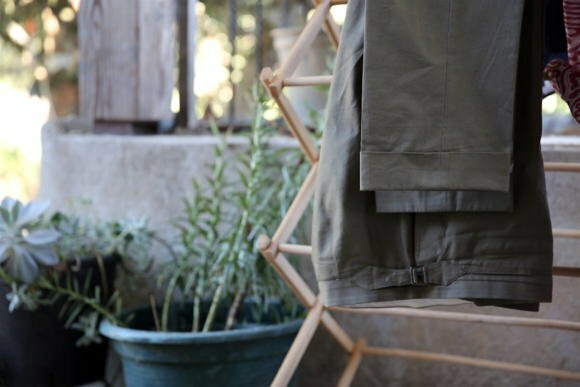 I’ve recently picked up a pair of 265g cotton twill trousers from Brisbane Moss which I’m wearing in Sweden (around 2-4C) right now and they’re fine, so I’m thinking they would be too heavy for summer. But on the flip side, I fear the cottons I’m considering for summer (160-190g or so) would be quite flimsy.. I come from a tropical country which can be very humid and hot. Would you recommend dry cleaning of summer wool pants after say 4 uses? Any other tips are welcomed! To be more specific, they are Holland and Sherry’s Intercity wool fabric. Is it recommended to hand wash them instead of dry cleaning or machine washing them? I am looking for summer casual trousers ( Spain is so hot in summer). I am considering one pair of 100% linen ( 390 grs). Other option is a mix 75% cotton 25% linen (370grs). Are this options ok for a fresh casual trouser? Hey simon, what are your thoughts on khaki crispaire as a pair of odd summer trouser? Would it be too formal given its drape and smoothness to work casually with (polos and t-shirts) and yet, too casual in color to work in more formal situations? Also, would there be a specific shade of khaki you would recommend? More towards mid brown or towards yellow? Many thanks! I have a pair of yellow-y khaki crispaire trousers from Luxire styled pretty casually. I find that they can work well with darker polos (navy, green, etc), especially if hot and sunny. In my experience, how well they work is context dependent (bright sunny day in a more casual US office) . For me, they’re very versatile and get quite a lot of wear both with and without a jacket. I have one sand color W/L/S suit and really love the cool and dry feeling when wearing it in the summer. But I found it’s not easy to separate the trousers to pair other sport jacket. What’s your opinion of wool/linen/silk odd trousers? In general they don’t work that well as separates – not enough body and drape unfortunately. 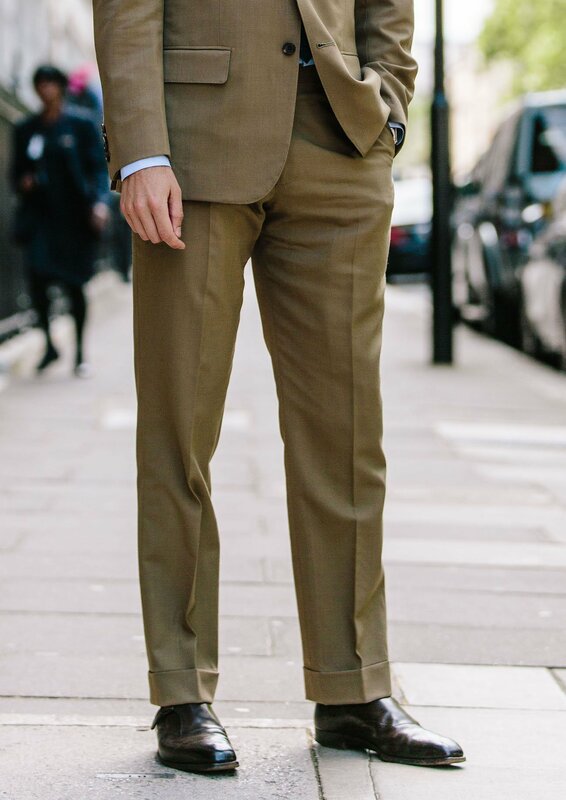 1) what are some summer fabrics you would recommend for trousers which are incredibly hard wearing? 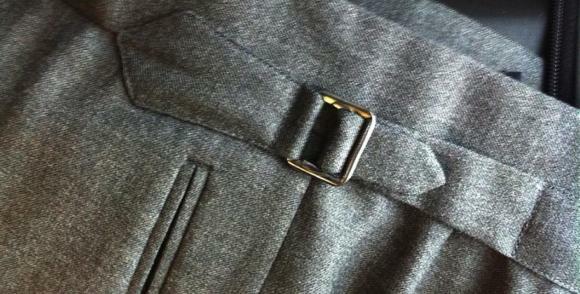 2) what shades of grey for odd trousers do you recommend if one has light and mid grey covered? Would something between mid grey and charcoal be versatile or should one stick to mid grey or charcoal? Simon, I know it’s very hard to generalise, as there are so many variables, but how would you say cotton performs relative to wool in terms of keeping cool? Would a 300g cotton wear warmer, cooler, or the same as a relatively open weave wool (fresco/crispaire) etc? since smells and sweat is mentioned, which is an essential parameter during summer or during other sudatory activities like dancing, i was wondering if a mixture of wool with synthetic fibers would perform better here. I am about to commission my first trousers purely for dancing argentine tango. This kind of trousers usually have wide legs and double pleats on the front and even pleats on the back side. My first research regarding materials resulted that, that kind of trousers are usually made either from 100% synthetic or from a mixture of synthetic and a maximum of 50% woolen fibers. Nobody of those specialized tailors could really answer my question why not 100% woolen. Most of them said that due to the synthetic portion a better drape of this wide trousers can be achieved plus minimization of creasing. Some also mentioned the cost factor, meaning 100% woolen would make them too expensive. That kind of trousers are usually made to measure, with very poor finishing (to keep the cost low) and the price is ranging usually between 100 and 200 Euros. One can choose out of a small range of fabrics but bringing your own is not welcome and even refused from some of those tailors, because the ones they are offering have a “guaranteed” and “tested” drape. What are your thoughts on making such trousers of a 100% woolen fabric? For instance, out of a very high twist? Or fresco? And what is your opinion of making them out of linen or a mixture of linen with cotton or even linen with wool? In regard of performance in Sweat/Smells, Creasing and Drape? I really would appreciate your thoughts on that. Synthetics will smell more, but they will be hard wearing, remain sharp and be considerably cheaper than wool. I’d imagine that is why such trousers are made from synthetics – because the wear is hard, and the budget cannot be big because they won’t last as long. I’d suggest using 50% wool if you could, but I’d hesitate to recommend 100% wool or linen, just because I’m not that familiar with how they will be worn, and in particular how hard. Do you think navy linen could work as separate trousers? Or do you feel, with navy trousers , material is irrelevant? Thanks for the reply. In terms of weight for separate trousers, is 10/11oz ok? Or would you go to 12oz if it’s available? In past posts , you suggest the former is ok. However, would it be better to go heavier? As always, many thanks and hope the pop-up shop goes well. Can you elaborate on why you think navy linen doesn’t work? I understand why you think worsted wool does not (looks like an orphaned suit trouser). But I assume that’s not the reason for linen. To be clear, with both I’m just saying that it is hard to work as part of formal combination, with a jacket. Fine with knitwear, just a shirt etc. Looking like it’s part of a suit is only a problem with navy worsted. Navy is still hard to wear as an odd trouser in other materials, eg flannel. It’s not impossible, but other colours like greys, browns, greens and other naturals usually look better.